Yoo Ye-eun was born blind and adopted in 2002. 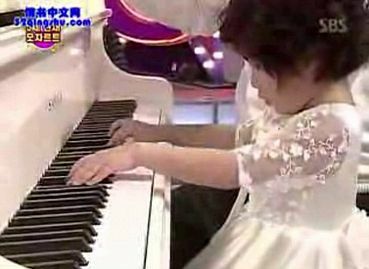 At the age of three she started to play piano despite that neither of her parents have a musical background. Ohhhh! So sweet the child is.Gosh she is really a gifted child. Congratulations to those who adopted her and who had taken so much care of this little blind girl. How proud they must be when they hear the little one playing the piano so beautifully and at the same time singing so clearly. Hats off to the little blind child named Yoo Ye-eun. She is certainly talented and deserves a standing ovation - what do you say? Thanks Monica for sharing this interesting article with us. Noted! Oh, she is so cute and talented. Thanks for posting a happy story! What an awesome natural talent. It brought tears to my eyes. This child will go far in the music world and the little girl who sang "You raise me up" will go far as well. She has natural talent also. All she needs is a good coach. Thanks Monica for the beautiful story. thanx..i saw her on the tv last nite. glad U hav shared it with all. A very touching story..Music is a wonderful thing to indulge your children in.. Thanks Moni for a great uplifting story..
To everyone, my own 2-cents. I don't want to be hard-nosed about this, but the child would have "perfect-pitch" whether she was blind or not. Blindness has NOTHING whatsoever to do with how one hears or interprets music! There are children, teens AND adults all around the world with it (heck, I wish I had it! ), and are able to repeat anything they hear (usually on a piano). What's great is that she's young & talented, but please DO NOT think it's because she's blind. Dear Kactus Kat: Thanks for letting us know what your point of view is...But honestly nobody would EVER think that her talent comes from her blindness.I did see her story on TV,and they said that when she was born,her mother rejected her DUE to her blindness....This,hurt my heart,so much(difficult to explain my feelings ,but I'm sure you'll understand,so I looked for her news on internet,in order to share it with you... The most important thing in this story is this that this little girl was loved,just as she is,(like all human beings should be loved and respected)that she has a family,that loves her,weather if she is talented,She's found a family!Thanks to all of you,who have taken the time to read,note FW and commented!Blessed be all! God is an awesome God. He give gifts to whomever He pleases. What a wonderful gift of life, and a beautiful art of living it. I certainly didn't make my comments to insult your choice of articles posted, OR coming down hard on ANYONE here who cares deeply enough about people to share a story with all of us here. I do want people reading it NOT to feel sorry this girl, or pity this girl because she is blind. There are millions of unwanted children. She is VERY fortunate to have a family pick her to adopt. They can only answer WHY she was chosen. I just want everyone to treat blindness with the respect it deserves and not to think that she is especially talented just because she was picked by a family, rejected by her parents, OR has perfect pitch BECAUSE she's blind. The true way to respect her is to only wish that she's has a happy healthy life - like we wish for everyone here on Earth. Yoo Ye-eun is a superstar! What a beautiful and special little girl. So much talent, just beyond words. I am in awe. Thank you so much for this Monica. Extremely touching! Thanks Monica for sharing.... what wonderful talent God has blessed her with. Yes, Matthews Thomas, God sure is an awesome God! God bless you Monica,it's a gift from Him showing your kindness .